Great Thread, binds and holds what you tie - excellent. The breaking strength on Veevus threads is more than 2x stronger than comparable Uni-Thread or Danville products AND offers less thread build-up. Grabflies uses this thread size for it's Intruder Flies. Fine Grizzly Barred Legs by Hareline. Grizzly Barred Medium Legs by Hareline. Give your fly movement and a natural barred look. Grabflies uses these legs. A specially coated ceramic tube to prevent thread fraying. Fits very comfortably in your hand. 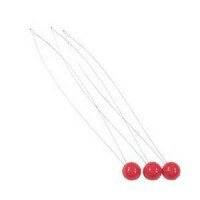 Griffin's Threader Set includes three wire loop threader devices made of high quality spring steel. Makes threading your bobbins easy. Premium Dubbing Wax - Supersticky Formula. 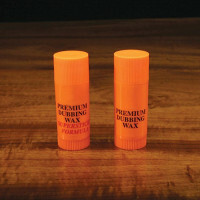 High quality dubbing wax from one of fly fishing's most respected names, in a large Deluxe push-up tube with an orange color that's easy to find on a tying bench. Great for keeping your thread in place on bobbins. Veevus 240 Denier Power Thread- 240 denier thickness with Veevus strength. Some of the best fly tying thread money can buy. 100 meter spool. A good thread for smooth heads on larger flies. 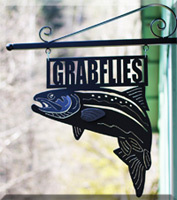 Grabflies uses this thread on it's Moal Leeches. Grabflies uses this size for it's thread head Fish Tacos. Grizzly Barred Flashabou is a unique material to add fantastic attraction to your flies. 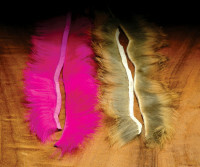 Senyo's Fusion Foil Legs are bright and shiny barred silicone legs that add life and color to your flies. Add to your Steelhead Intruder flies, nymphs, wet flies for movement and shimmer. Bobbins are the critical tool in tying since they must keep smooth tension on the thread spool and have super smooth inserts to apply the thread to your fly. This is shiny fluid material like traditional Flashabou but has shine way beyond the original two-dimensional Flashabou. 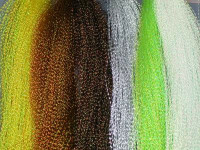 Flashabou's reflective qualities are combined with color shifting technology to form an iridescent and holographic effect in a single fiber. 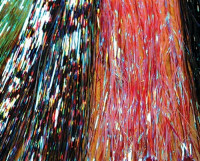 The fibers actually change color with their surroundings, much like the scales of real minnows. 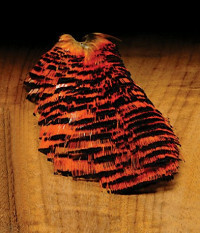 You have seen it (or a prototype of it) in our fly tying videos. You have called and emailed and asked about it. And now it's (almost) here: the OPST Shank Chuck Tool. It took us a long time to dial this one in. The challenge was first, to make a tool that would fit with just about any vise on the planet. We succeeded. If this tool does not fit with your vise, we will refund your money. The second challenge was finding a tool that can both shanks and some tubes- by unscrewing the chuck housing, you can flip the inner chuck one way for shanks and the other way for tubes. This material may be "charged" by exposing it to a bright light, causing it to slowly emit a soft glow for several minutes. 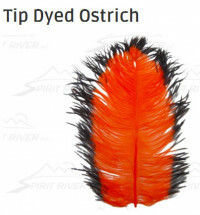 Try it for increased pattern visibility in murky waters or night angling. OPST's new junction tubing is perfect for rigging intruders and other flies with a trailing hook. 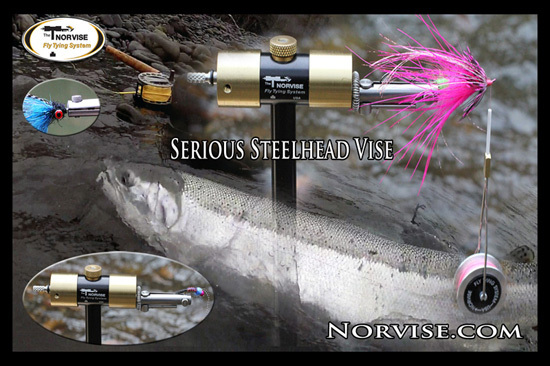 The tubing fits on the hook and secures it to the shank of the fly, allowing the fly to come loose and reducing leverage when a fish is hooked. Our tubing comes in orange, white and black. 20 inches per pack. 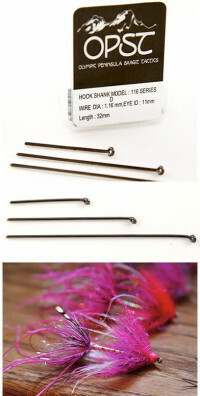 Tired of tiny beads, hooks and other materials migrating all over your tying table? This Silicone Bead Pad is the solution. 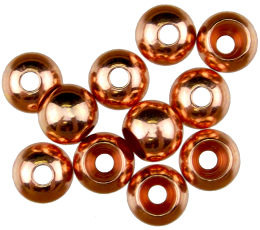 Micro pockets on one side control beads. The flip side is smooth and can be used for adhesives and epoxy, which will not stick, making for easy cleanup. Size: 7.5" x 5.12". Our original design is so good, it too has been copied by our competitors. 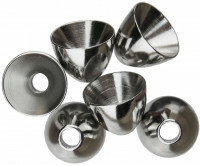 Our machining is unsurpassed and the plating is fantastic. 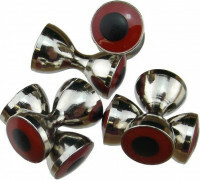 Spirit River is proud to be known as the leader in quality on all our brass products like these incredible eyes. Each eye is machined on a screw machine one at a time. They are tumbled to remove many of the machining marks...then we plate them with a really high quality finish. Each eye is inspected then has resign poured into the pupil area. Next we bake it to harden the pupils. Our process takes a heck of a long time & yes it is quite expensive...but you should expect the very best when you take your time and your skills to tie your own flies. These eyes have proved themselves to be a great addition to any tiers arsenal. Our unique high quality eyes give patterns beautiful bait-fish appeal which predators key in on while also giving them the weight they need. Fish Skull Articulated Shanks eliminate the search for the perfect shank for tying intruders, articulated flies and string leaches. These articulated shanks allow the fly tyer to simply slide a hook on without using a string or junction of any sort. Tie your fly on the shank and permanently fix the articulated hook or slide it on and off. 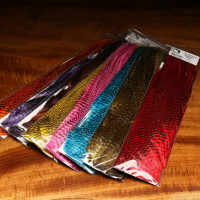 Holographic Flashabou is a holographic material that is great on all trout streamers, spey flies and saltwater fly patterns. It has that extra sparkle. Small enough to tie small flies, strong enough to spin deer hair. 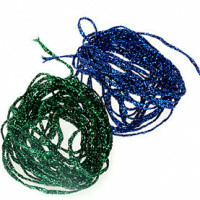 A wonderful all around tying thread, especially for heavy handed beginning tiers. This has been one of the sport's most popular dubbings for tying both freshwater and saltwater flies. Great sparkle and dubs beautifully. Take special note of the UV colors, in which the sparkle is deep blue. Great sparkle and dubs beautifully. Take special note of the UV colors, in which the sparkle is deep blue. Excellent dubbing qualities - spins on great. The original Flash. A well used slightly twisted mylar with pearlescent undertones gives patterns that subtle flash or can be used as in larger amounts for Fry and Baitfish. 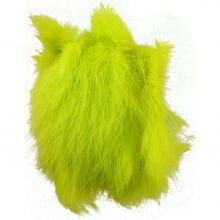 Rabbit fur on the hide is some of the best material for tying big sub-surface flies. Probably no other material has as much life-like movement when wet. 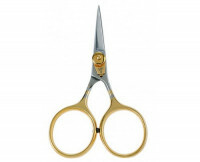 Features include black chrome finish, up-eye forged shank and reversed-bend super needle point. Great for Moal Leeches and Intruder Style Stinger hook setups. Features include black chrome finish, up-eye forged shank and reversed-bend super needle point. Great for Summer Moal Leeches and small Intruder Style Stinger hook setups. 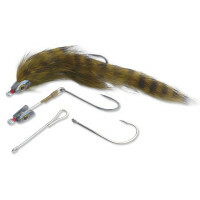 Crosscut rabbit strips are cut at an angle for tying for Moal Leeches, bunny flies Fur on a crosscut rabbit strip lays to one side making it a good choice for palmering. 1/8 inch width.